Are you looking for a crochet stitch that provides lots of texture and a rustic and a bit messy look? I think you will love the Mini Berry Stitch! This stitch provides a nice thick texture but a little more ragged look than they cleaner looking puff or popcorn stitch. The Mini Berry Stitch is a modification of a single crochet and will be alternated with a regular single crochet to create the scrunched down texture. I originally discovered this stitch when I was looking for a texture for my Tons of Texture Slouch Hat. I stumbled across this stitch and it took a little while to convince myself to use it because of the messier looking texture, but I am so glad I worked this stitch up. The way this stitches set on top of each other gives this hat such a unique look. Love to crochet? Check all my free pattern here. Now on to the stitch tutorial. I decided to do all my stitch tutorials as video tutorials because I find they can be easier to understand if done right. Gauge is determined by using the Mini Berry Stitch. I recommend crocheting a swatch with 12 sts and measuring it to see if it is 3 inches. Basically the Mini Berry Stitch it a modified single crochet. It feels like you start a ingle crochet then half way through it you stop and chain 3 then complete the single crochet stitch. Mini Berry Stitch – Insert you hook into the next stitch, Yarn over and pull loop through stitch, *Yarn over and pull through the first loop on the hook* repeat from *to* 3 times, Yarn over and pull through the 2 loops on the hook. Your Mini Berry Stitch will be followed by a Single Crochet to scrunch the stitch down. Make sure you are pulling the chain in the middle of the stitch to the same side of the work each row. When working Mini Berry Stitch you will want to Chain any odd number of chains. Large (Blanket) 12 inch Swatch we will chain 39. Medium (Book) 8 inch Swatch we will chain 27. Small (Block) 4 inch swatch we will chain 13. Ch 13, 27, or 39 depending on the size sample swatch you would like to make. R1: Sc in the second Ch from the hook and each Ch across. R2-? : Ch1, turn, *Bst, Sc,* repeat from *to* until the end of the row. Repeat row 2 until your project is as long as you want it to be. For the 12 inch square work until you have a total of 44 rows. To make a 8 inch square work until you have a total of 30 rows. For the 4 inch square work until you have a total of 15 rows. 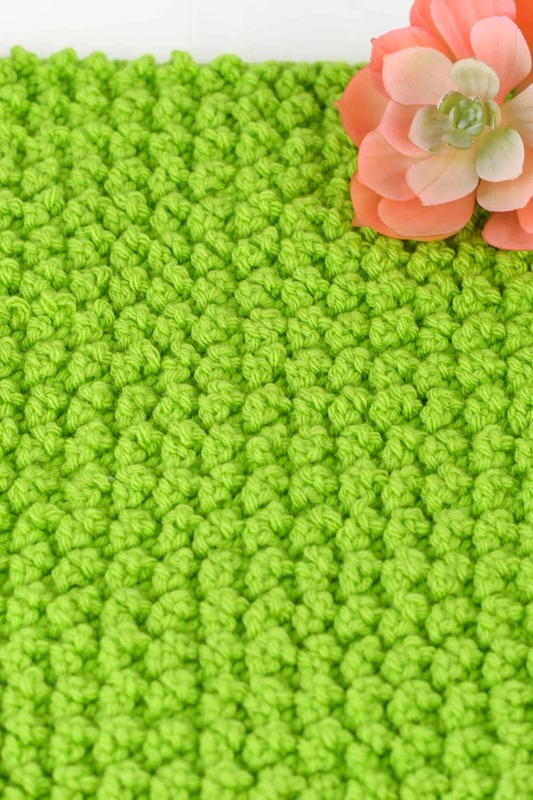 A Single crochet border makes your edges look nice and is recommended if you are making any of the March Texture Madness projects. Did you like the tutorial? Share your Mini Berry stitch swatches with me on any social media and tag me @Windingroadcrochet, #windingroadcrochet, #ourcrochetjourney. Let me know how you like the stitch in the comments below. Will you use it for a project? Written pattern, tutorials, graphs and pdfs of Mini Berry Stitch Tutorial are copyright Windingroadcrochet.com. Please do not reprint or repost this content as your own, but please feel free to share this link with others. You can find more information on sharing my work with others in the Terms and Conditions Page. I am so glad to hear that. I wasn’t sure about it until I worked it up, then I fell in love with it and used it for my Ton’s of Texture Slouch Beanie. Love the berry stitch. This is a new stitch for me and I love it. Thank you. You are welcome it is one of my favorites. Really like this unique stitch. And it’s so easy to make! I’m considering using it to make myself a couple bathroom rugs. I will probably use a double strand since I want it to have a tweed-ish look to it. What size hook do you think for 2 strands of 4 weight sized yarns? An I? Or J? Thanks for the video – it made it so easy to learn this stitch and leaves no questions! Great job! I am thinking a J hook, but I recommend trying a small sample swatch to be sure. I am noticing lately that I tend to lean towards a bigger hook when I used to like everything with a super tight tension. Try a small sample and see what you like. A tighter tension will mean more loops and a looser tension means the project will get done faster. Another question (guess I did have a couple) – what happens if you do another berry stitch immediately after the first one, instead of a single crochet between each berry stitch? Does it get too lumpy? Just wondered if you’d even done that and how it turns out. Thanks. I have not tried it. I find the Sc after the berry stitch helps crunch the stitch down and pushes out the ‘chain’ in the middle of the berry stitch. Looking forward to trying this, but I’m a little confused – the instructions are mixed between the “Mini Berry Stitch” and the “Chain Cables Stitch”. In the video, you state the starting chain should be a multiple of 2 +1; in the instructions it says 4 + 1 (which is the Chain Cable Stitch), but in the pattern you use an even number to start. I realize it is because you have an odd number of stitches in each row, but it’s a little confusing to follow at first. You can actually work the stitch both ways, but to keep things consistent I have corrected the written portion and made it match the videos. I do tend to copy and paste to keep all the post looking consistent but my midnight proofreading is not the best. Thanks for letting me know. Everything should be good now.